NASCAR XFINITY Series drivers Ty Majeski and Chase Briscoe were among several drivers participating in a two-day test session Tuesday and Wednesday at Bristol Motor Speedway. It was the first time at Bristol in any type of race car for renowned short track racer Majeski and the first time in an XFINITY Series car at Bristol for Briscoe, who competed at Bristol previously in the NASCAR Camping World Truck Series. The two drivers are part of a trio, along with Austin Cindric, who are splitting time this season at the controls of the iconic No. 60 Ford owned by Roush Fenway Racing. Majeski, who will compete in 12 races in the car, will make his 2018 XFINITY Series debut at the Fitzgerald Glider Kits 300 at BMS on Saturday, April 14. He said he was glad he was able to make some laps here prior to race weekend. "It's a great opportunity for the organization to come here and get better," Majeski said. "I think we've made some good gains to come back here and race in a couple of weeks." Majeski says he was in awe just walking into the historic NASCAR short track, not to mention the first time he mashed the gas for a lap around the World’s Fastest Half-Mile. Briscoe finished 12th in the UNOH 200 Truck Series race last August and says he is looking forward to driving the famed No. 60 car during the Food City 300 XFINITY Series race this August. 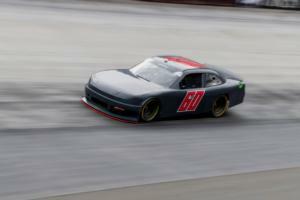 Briscoe, who finished 15th in his XFINITY season debut at Atlanta in late February, said there are some subtle differences to the feel of the XFINITY car versus the Truck on Bristol’s all-concrete track. He says it has always been a dream to race at Bristol. And to race here in the winningest car in the XFINITY Series, the No. 60 car, which has been driven by NASCAR greats Mark Martin, Greg Biffle and Carl Edwards, among others, just adds to the flavor. The day after the test it was announced that Briscoe also will compete in the Fitzgerald Glider Kits 300, driving the No. 98 Ford Mustang for Stewart-Haas Racing. A ticket to see Majeski and Briscoe in action at the Fitzgerald Glider Kits 300 XFINITY Series race on April 14 will also give you access to take advantage of so many fun activities to make a complete weekend of family fun, including great video entertainment provided by Colossus TV, the world’s largest center-hung video screen, premium VIP experiences like the Chairman’s Experience, tailgating, on-site camping, concerts, great food and beverages in the concession stands throughout the property, and so much more. And for families who want to bring the entire clan, Bristol Motor Speedway officials are making it easier than ever for kids to have an awesome experience. Kids’ tickets (12 and under) are free and adult tickets are $5 for Friday’s (April 13) Bush’s Beans Pole Day. On Saturday (April 14), kids’ tickets are free and adult tickets start at $30 for the Fitzgerald Glider Kits 300 NASCAR XFINITY Series race and the Zombie Auto 150 NASCAR K&N Series event. On Sunday (April 15) adult tickets start at $60 for the Food City 500 and kids’ tickets are $10. Be sure to buy your tickets before April 1 when prices will increase. For all races, each child must have a physical ticket in hand to enter the gates. The Bristol Motor Speedway ticket office is the only authorized location that can produce the free kids’ tickets.